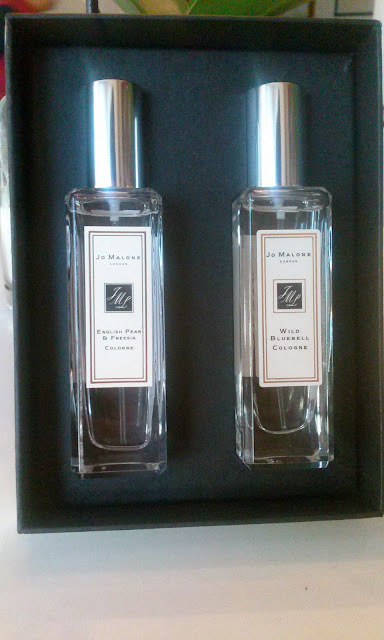 Every time I walked past the Jo Malone counter, I always have to spray on the English Pear & Freesia cologne. It was either that one or the Nectarine one, but the English Pear won me over. It got to the point that I would talk about the Jo Malone scents so much that my friends were even happy that I finally got it! I also had smelled the Wild Bluebell scent and fell in love with it too and couldn't decide on just one. After a few days of research and testing out a sampler, I decided on both because these two scents actually layer over each other wonderfully! The English Pear & Freesia and Wild Bluebell cologne fragrances were both in the 1 oz size and I bought them for $60. Yes they are pricey, but that is why this was more of a splurge/treat for myself. At first I was thinking about only getting the 3 oz size for $120 of the English Pear, but decided against it because I don't use up perfume that quickly and I wanted another option to have, plus again, the two scents I picked layer so nicely together. English Pear & Freesia Body Creme. This was absolutely pricey and definitely a splurge at $75 but it is absolutely luxurious to the max. I only bought this because of the 3x points incentive as well as the fact that I had tried it on from a previous trip to Nordstrom and grew a bit obsessive about it. Originally, the English Pear & Freesia cologne changed it's smell on me due to my body chemistry and wasn't as pear-ish as I would've wanted it to be, which is why I have been hesitating to buy it previously. The lady at the counter layered on the cologne over the body creme and the smell was exactly what I wanted it to be and it stayed on. Plus, the creme is so silky and soft and left my skin feeling so supple and smooth. 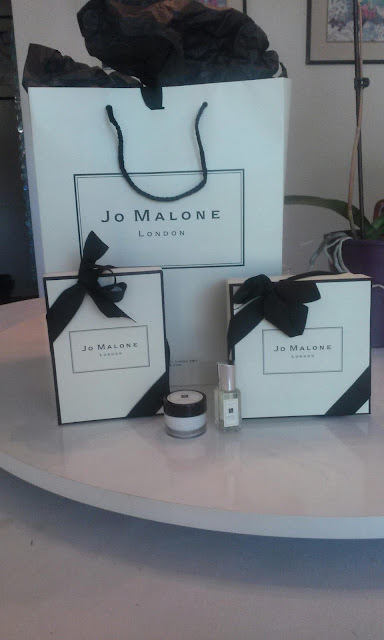 If you spend over a certain amount at the Jo Malone counter, they had special small gifts to give away. They ran out of another sample perfume size but I was still happy with the two small gifts I did receive. The first is the Orange Blossom body creme which I do like the smell of the cologne a lot so it was nice to try out the body creme. Another item I received as a gift with purchase is a small travel size cologne of the Lime Basil & Mandarin. This isn't something I would've picked for myself, but I'm glad I was able to get a good size of this, plus, it is perfect to take travelling with me as well. I will be doing full on reviews on the items I picked above as I wear them throughout the Spring season. Have any of you guys tried or own any Jo Malone products? Do you have a particular scent that is your absolute favorite? Do you guys have any recommendations?!? 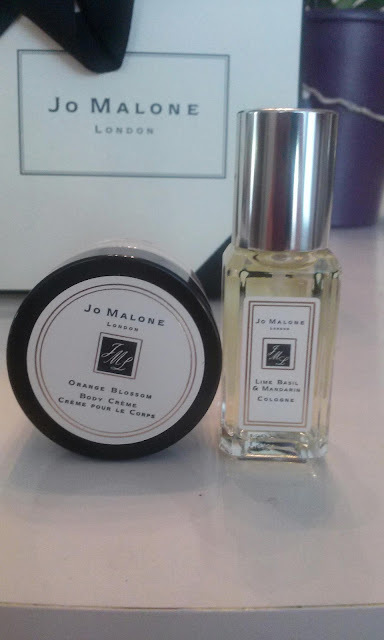 I can just smell the scents through the post lol I always stop by Jo Malone but my fiance talks me down from buying the candles haha I may have to persuade him on the perfumes though because they sound amazing! haha I can see why he talks you down on them, they are pricey, but they are so delicious smelling! I reallllly want one (maybe on another treat for myself moment haha). The perfumes are truly amazing though! I'd say test some out when you walk by and see how it sits on your skin. He may like it enough on you to get it for you ;) or you could ask for it as a gift since it would make a lovely birthday/anniversary/holiday gift too!